Funnily enough, hundreds of media outlets report that a Minnesotan astronomer named Parke Kunkle has noticed something that every person with a basic knowledge of constellations has known for centuries: the Sun's path in the heaven is crossing 13 and not 12 constellations. 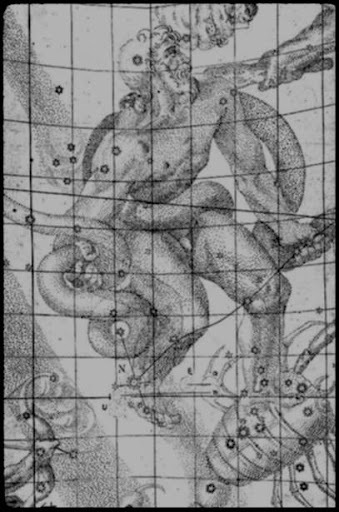 Johannes Kepler's drawing of Serpentarius: he was a skillful artist, wasn't he? Planets - search on your iPhone App Store or click above. A good free app with positions of stars, constellations, Sun, Moon, planets, and detailed 3D animations of important planets. One of our blue, not green planet's motions is precession which means that every 26,000 years, the direction of the Earth's axis (which stars it's targeting) makes a round trip. Because the months and seasons are defined so that solstices approximately keep their dates, regardless of the position of stars it means that approximately every 2,000 years (1/12 of those 26,000 years), the dates of the "months defined by constellations behind the Sun" shift by one sign. That's about the time since the time when people began to play with the horoscopes, so all the horoscopes have shifted by one zodiac sign. They will continue to shift. The amount of nonsense written about these topics is staggering, too. For example, there seems to be a consensus between all the media that the path of the Sun among the constellations has been changing because of the Moon's wobbling motion - and so is the Earth's precession, they say. Well, the internal motion of the Moon has no chance to influence the motion of the Earth-Moon center-of-mass (and both Moon and Earth oscillate around the plane where their common center-of-mass is orbiting the Sun) so you can be pretty much sure that the ecliptic couldn't have changed measurably because of the Moon - it's the other planets that exert this influence. On the other hand, the precession with the 26,000-year periodicity was already known to Aristarchus of Samos about 280 years before Christ. But it is known to almost no "science" journalist in 2011. Indeed, this precession depends on the forces mostly from the Moon and the Sun as well as the non-sphericity of the Earth.